The last guests for the Fall Carlisle Car show just checked out this morning. Tomorrow night folks begin to check in for the Antique Auto Club of America Hershey Car Show. Cars, cars, and more cars! Other fun guests checking in tonight are some horses (and their riders) getting ready to compete in the Pennsylvania National Horse Show . Beginning October 8, the Farm Show Complex in Harrisburg will be the venue for over 1200 horses competing for a top prize of $75,000 in the Grand Prix de Penn National an FEI World Cup Qualifying Hunter Jumper event. It's so interesting to watch all the competition at the show. It begins with youth and local folks and ends with the BIG jump on Sat, 10/17. The horses are beautiful animals; the riders are are such experienced equestrian folks; and the trainers and grooms are all dedicated to the care and safety of the animals and their riders. Come enjoy the show! And as if that's not enough for next weekend - it will be Parents' Weekend at Dickinson College AND the Harvest of the Arts Festival in downtown Carlisle. 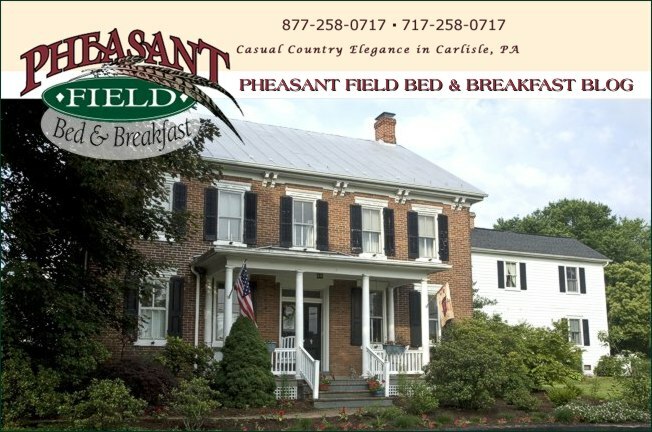 Visit our website to check availability and to make your reservation at Pheasant Field Bed & Breakfast!